2013 December Gujarat State Eligibility Test for Lectureship (G SET) / State Level Eligibility Test (SLET) Examination Paper I conducted by M. S. University (MSU) Baroda, Test Booklet Code (Set or Series) A (General or Compulsory for all subjects is given below. 2. Which of the following does not justify teaching as a profession? 3. Which is not a significant challenge faced by a beginner teacher? 6. Which of the following ensures greater participation of students in classroom? 10. Which of the following is not the basis of scientific method? 12. ……. Is unsuitable for graphical representation of continuous data. 13. Which of the following arrangements from the smallest to the largest unit of storage holds good in information technology? 14. Which one of the following is not a network device? 26. Letters in the set ARUTF: DSXUI have certain relationship. Under the same relationship, mark the correct choice for the letters of the set PQRSF: ………..
27. In a certain code RSDFRBMUG means SREESANTH, then how FIXING can be written in the same code? 28. At what time between f4 and 5 o’clock the minute and hour hands of a clock point in opposite directions? 29. If PEN=25 and HEN=17, then MEN=? 30. In a row of girls, Bindu is twelfth from either end of the row. How many girls are there in the row? Investigators have noticed some similarities between the fantastic events in fairy tales and those in adult dreams- the fulfillment of wishes, winning over all competitors and the destruction of enemies. There are, of course, very significant differences also. For example, in dreams more often than not the wish fulfillment is disguised, while in fairy tales much of it is openly expressed. To a considerable degree, dreams are the result of inner pressures which have found no relief, and of problems which beset a person to which he knows no solution and to which the dream finds none. The fairy tale does the opposite; it projects the relief of all pressures and not only offers ways to solve problems, but promises a happy solution. We cannot control what goes on in our dreams. Although our inner censorship influences what we may dream, such control occurs at an unconscious level. The fairy tale, on the other hand, is the result of conscious and unconscious content having been shaped by the conscious mind, not of one particular person but of many in regard to what they view as universal human problems. Only if a fairy tale met the conscious and unconscious needs of many people, would it be told and retold with great interest. 32. Which of the following is common in dreams and fairy tales? 33. According to the passage, fairy tales differ from dreams in which of the following characteristics? (III) Their enduring general appeal. 34. Which of the following is not true? 38. Waste management has been one of the most current issues being tackled at present. 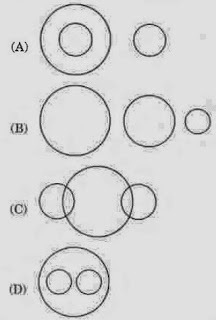 Which of the following is a good example for it? 39. A few actions of youth that point to their environmental insensitivity are given below. Which does not belong to this category? 42. Which of the following is the cause of change in seasons? (i) Union elections in universities should not be held. (ii) Students leaders are never able to perform well in the study. (iii) Do study for few hours a day regularly even if exams are far away. (iv) Unless necessary credits are earned, degree cannot be awarded. 44. Which of the following diagrams indicates the best relation between Travellers, Train and Bus? 45. Of the following statements there are two statements both of which cannot be true but both can be false. Which are these two statements? (i) All the cricketers are match fixers. (ii) Some cricketers are involved in match fixing. (iii) No cricketer is involved in match fixing. (iv) Some cricketers are dedicated to cricket. 46. Consider the following statement followed by two assumptions (i) and (ii). Choose the correct answer. Statement: Success is how much a person bounces up after hitting the bottom. (i) A person can totally fail. (ii) It is possible for a person to rise again after failure. (A) Only assumption (i) is implicit. (B) Only assumption (ii) is implicit. (C) Both the assumptions (i) and (ii) are implicit. (D) None of the assumptions (i) and (ii) is implicit. 47. In the following, a statement is followed by two conclusions (i) and (ii). Decide which conclusion is valid. Statement: Out of 200 runs made by a team in a one day cricket match, 160 runs were made by spinners. (i) 80% of the team consists of spinners. (ii) The opening batsmen were spinners. (A) Only conclusion (i) follows. (B) Only conclusion (ii) follows. (C) Either conclusion (i) or conclusion (ii) follows. (D) Neither conclusion (i) nor conclusion (ii) follows. 50. Among the people with age under 30, what are the odds that they always exceed the speed limit? 51. What is the % different in the positive attitude of over 30 people towards not exceeding speed limit? 52. Overall, what is the “risk” of always exceeding the speed limit? 53. What is the relative risk of always exceeding the speed limit for people under 30 compared to people over 30? 54. Among the people with age over 30, what is the “risk” of always exceeding the speed limit? (A) Students can take up any number of programmes at a time. (B) Student can join a programme at any time. (D) Student can appear in the examination at any time. 57. The birthday of late Dr. Abul Kalam Azad is celebrated as …. in India.